Preparation time: each about 20 mins. 1. Hard-cook the eggs, then shell. 2. Mix the flour with the finely grated cheese and all of the other ingredients except the crisp bread crumbs. 3. Use just enough milk to bind the mixture. 4. Divide this into four and roll each portion around an egg with damp fingers. 5. Coat evenly in the bread crumbs. 6. Fry in hot fat for approximately 2 minutes – do not overcook. 1. Roll out the pastry and cut into 12 rounds. 2. Mix dates, grated cheese and nutmeg together, and place a little on each round. 3. Damp edges of pastry and bring to center, pinching firmly. 4. Place on baking sheet with joins underneath, make 3 slashes across the top of each pastry, and brush with water; bake until crisp and brown. 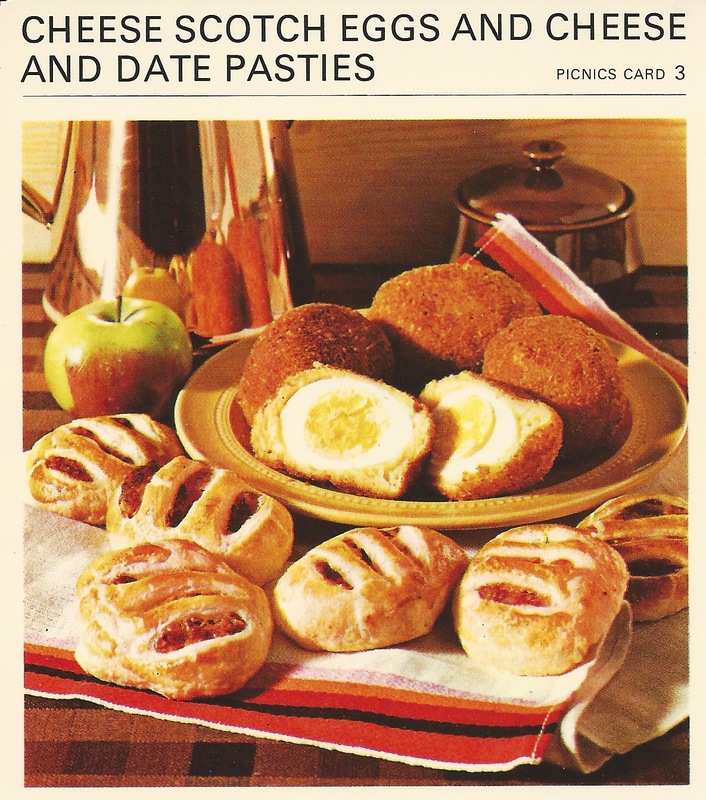 TO SERVE: With salad; cheese and date pasties may also be served as a dessert. WHAT???? 4. Divide this into four and roll each portion around an egg with damn fingers. One of my better typos I’d say. It was funny while it lasted! I know there is an easier way to do this. When I remember I will let you know because it was a very nice recipe.